Sightless people face obstacles almost everywhere they go. Often because they can’t exercise easily, they don’t. Many of them gain weight as their quality of living declines and their health deteriorates. The video shows blind folks at the Institute for the Blind of Taiwan practicing Tai Chi push hands, getting all sweaty, which they don’t get often. Tai Chi form and push hands are among very few exercises that the blind can do and can do well in spite of their disability. In fact, their ability to push hands may be enhanced by their lack of sight, and consequently a lack of visual distractions. Sightless people are more sensitive than sighted people in the sense of touch, and that is a precious property in the practice of push hands. Therefore, the blind and perhaps even people with other disabilities are a population who can benefit greatly from the practice of Tai Chi Chuan push hands. Most people believe pushing hands to be a difficult skill to learn with a risk for injury while training. This misconception results from erroneous ideas and inappropriate technique. Suppleness in pushing hands means to stick to the opponent, to listen and follow his movement, to move in a continuous way without using force. Practicing in this manner not only safeguards from injury, but it also stimulates the body’s deeper potential. At a higher level, the skills of neutralization and fajing (discharge) are refined, as the coach draws the opponent’s upper body joints (wrists, elbows, shoulders, back, waist) to disrupt the structure of his lower body joints (hips, knees, ankles). For most people to keep their balance, they will need to rely on the full participation of their brain and nervous system, on the whole range of movement of their muscles, joints and ligaments. It is in this way, to keep the body stable, that the deeper potential is activated. A coach must be light and agile with his body and hands. He should not clumsily push and pull with hard strength, otherwise he might cause injury or bring about unwanted results. Not being light and agile also preempts the development of the skills of tingjing (hearing the opponent) and dongjing (understanding the opponent). As for his mental attitude, the coach must cultivate the qualities of humbly receding, yielding, and guiding. In Tai Chi Chuan practice, the hand never goes higher than the top of the head, and the elbow stays below the shoulder. The body is loosened, the back rounded, and the tailbone tucked in. This is a posture of self restraint, self effacing, and functionally self preservation. By purposely not exert yourself, you can remain energetic for the long haul—you remain the last one standing, long after your push hands partner has fallen from exhaustion that inevitably follows his overexertion. How do you achieve such energy economy? Master Wu Rong-Hui, with a team of experienced teachers, will transmit the secrets to achieve perfect relaxation in the practice of any Tai Chi Chuan form and pushing hands. From the Ten Essential Principles of Yang Cheng-Pu, Master Wu will clarify right practice of the skills of “Head straight and the neck relaxed”, “Sink the shoulders and drop the elbows”, “Hollow the chest and round the back”, “Relax the abdomen”, “Distinguish between full (yin) and empty (yang)”. 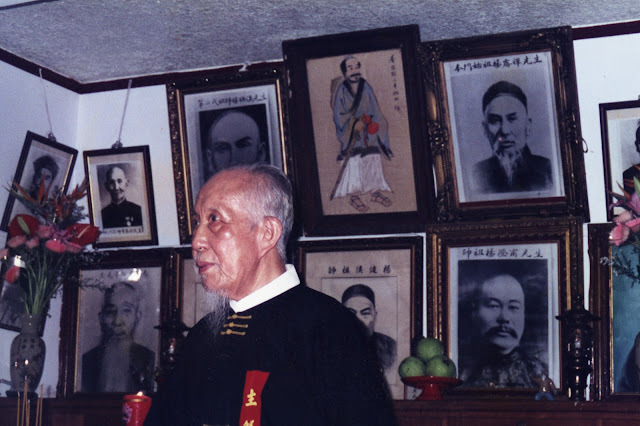 Building upon this set of basic skills, he will introduce the Eight Training Methods for Natural Movement laid bare by Master Soong Zhi-Jian : “Original Space Position”, “Original Body Position”, relying on the ground reaction force, inertia and the power of the waist, etc. By putting this foundational work into practice in Pushing Hands drills, Master Wu will guide us towards a natural understanding of Cheng Man-Qing’s principles of “No arms in Taichi”, “Lose to gain” and “Invest in loss”. As the Tai Chi Classics say : “Softness overcomes hardness” and “Four ounces topple one thousand pounds”. Time : Every Wednesday evening from 6:00 p.m. to 8:00 p.m.
For more information in English, please contact 0920-583-841.